Apple cider vinegar is an age old remedy that has been used over the years to treat and aid a huge variety of conditions ranging from arthritis to acne. It is produced by adding a type of acid forming bacteria to apple cider alcohol. During this second fermentation process, the friendly bacteria 'acetobacter' turn the alcohol into vinegar. This raw, unfiltered liquid in its natural, unprocessed state is packed full of minerals, vitamins and enzymes that offer a wide array of health benefits to humans and animals alike. How can ACV help my chickens? It's not just humans who can reap the health benefits of ACV. Apple cider vinegar has also been shown to help our feathered friends in many of the same ways. Healthy Plumage - Want your chickens to shimmer in the summer sun? Apple cider vinegar helps to keep chicken feathers soft and shiny. After all; healthy plumage indicates a healthy chicken. Increased Laying - Although this is not proven, there are many claims that including ACV in the diet of your chickens will result in increased egg laying. We also found that, after introducing ACV to our hens here at Eden HQ, there was an increase in laying throughout the winter months. Reduce Parasites - The powerful health-giving properties of apple cider vinegar help to treat both internal worms and external parasites in the form of lice or mites. Dosage can be upped for particular birds if they are known to be suffering from such problems. Mild Antibiotic - Apple cider vinegar contains a number of friendly bacteria that help the bird's immune system destroy and remove infectious organisms in a similar manner to antibiotics. Full set of Vitamins - Apple cider vinegar is jam packed with vitamins, including A, E, G, B1, B2, B6 and pro vitamin Beta-carotene as well as a full set of trace minerals, essential for growing healthy bones. Restore Natural pH Levels - When ingested, apple cider vinegar is known to have an alkalising effect on the pH levels of poultry. This helps reduce the risk of infection and mortality in poultry. Combat Stress Levels - Another traditional use for apple cider vinegar has been the treatment of stress in poultry. If your hens have moved location or there has been a recent death or wild animal attack, then it can have a dramatic impact on their egg laying ability. ACV is known to help settle things down and help get your birds back to normal. What type of apple cider vinegar do I need? Apple cider vinegar isn't all the same. In fact, there is a huge difference between cheap pasteurized ACV and the real thing. When shopping for apple cider vinegar for your chickens, be sure to look out for a few key things on the bottle. Contains the mother - The mother is the name given to the cloudy almost cobweb like bits that can be seen floating in the liquid of good quality apple cider vinegar. The mother is in fact a living enzyme created by good bacteria that is responsible for many of apple cider vinegars healing properties. Unfiltered - When apple cider vinegar is filtered, not only does it lose the above mentioned mother, but also a large amount of other beneficial enzymes and minerals. Chickens benefit hugely from these elements so to use a variety with no mother would make very little sense. Raw - Many cheap brands of apple cider vinegar are pasteurized, a process that involves heating the liquid to extremely high temperatures. This results in the loss of good bacteria and healthy enzymes. Raw, unfiltered ACV is cold pressed from organic apples and is not heated at any point during the manufacturing process. Dosage of apple cider vinegar for chickens? 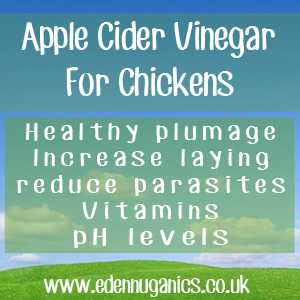 When feeding raw ACV to chickens we recommend a ratio of around 20ml apple cider vinegar to every litre of water. This will be enough to keep your hens in tip top condition. The most simple way to get your measurements correct is to use a syringe (obviously with any sharp needle removed before hand). Be sure to mix the solution well after adding ACV and only use plastic water containers as the acids in apple cider vinegar has been known to corrode metallic surfaces in a matter of weeks. Although apple cider vinegar is a great tool for keeping your hens healthy, it should not be in constant supply; instead we find that for general health and well-being, around one week a month is ideal. After the first week of feeding your birds acv you will be able to see a marked improvement in health and appearance. However, over time, the increase in egg laying and ability to combat stress better should become more apparent.